I have discovered many uses for canvas drop cloths that I buy from my local Builders Warehouse, and this is a great project for using up any leftover scraps that you may have lying around. You can create your own canvas placemats and paint on almost any design to suit a birthday party, celebration or special occasion. 1. Start off by dabbing paint onto the canvas rectangle as the background for your design. You can choose any colour acrylic paint that you want to use. Wet the sea sponge and squeeze before lightly dabbing on paint onto the mat. Let the paint dry and rinse out the sponge. Don't use paint that is too runny, as this will bleed into the surrounding fabric. 2. 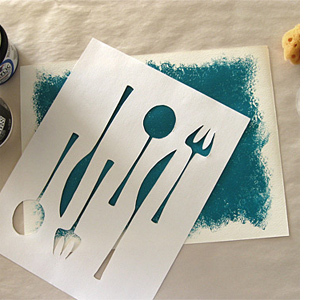 Print the template onto soft card or transfer onto acetate sheet. You can also print onto special overhead projector sheets that are intended for use in a PC printer. 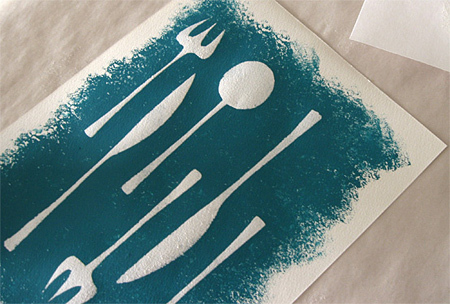 Cut out the design with a craft knife on a cutting mat. 3. Centre the stencil and secure in place over the mat with masking tape. Place newspaper on your work surface. 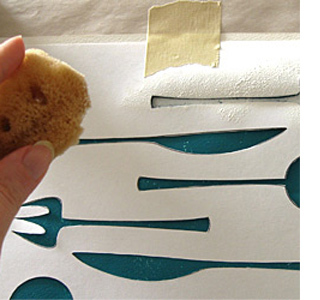 Dip the sponge into your choice of colour for the top design and lightly dab onto the painted surface. Depending on the desired coverage, you may need to sponge over the template shapes more than once. Again, rinse the sponge thoroughly after you’re finished. 4. Gently peel off the masking tape and lift the template. 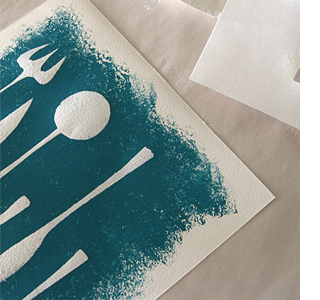 Allow your print to dry and then use a warm iron to go over the back of the mat. This will seal the paint into the fabric so that the mat is washable. You can use this same technique to make a matching tablecloth or serviettes.